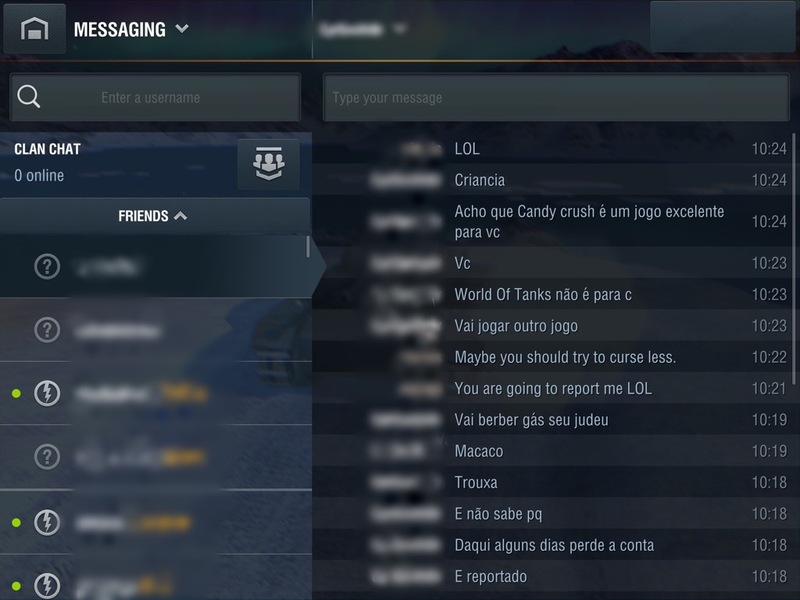 I made friends in game, it seems, with somebody who does not play well, insults in battle and then goes a bit further, when you try to defend yourself and give a pointer or two. No need to translate publicly. Please PM. Thanks. Edited by acrisis, 04 December 2016 - 04:07 PM. I assume he insulted your mother and claimed to impregnate her and told you to play candy crush. No mother thing actually, but a few other things. Tried to look up a few words, but the internet wasn't helping. This kind of language only worsens things in game and increases some negative perceptions and stereotypes. We all have frustrations. We may utter a bad word here or there. But, a series of obscenities and some of those lines (like 10:19) are completely uncalled for; in any language. I couldn't agree more. I suspect the anonymous señor's ancestors were probably abandoned in Brazil by a Portuguese crew that didn't want to listen to them on the return trip. The line at 10:19 is offensive and anti-semitic. PM me and I will provide you with the exact translations, which I am not going to post on an open forum. The player should be reported immediately. NONE of us should tolerate such vile hate speech. I noted that as well. User was reported within minutes. 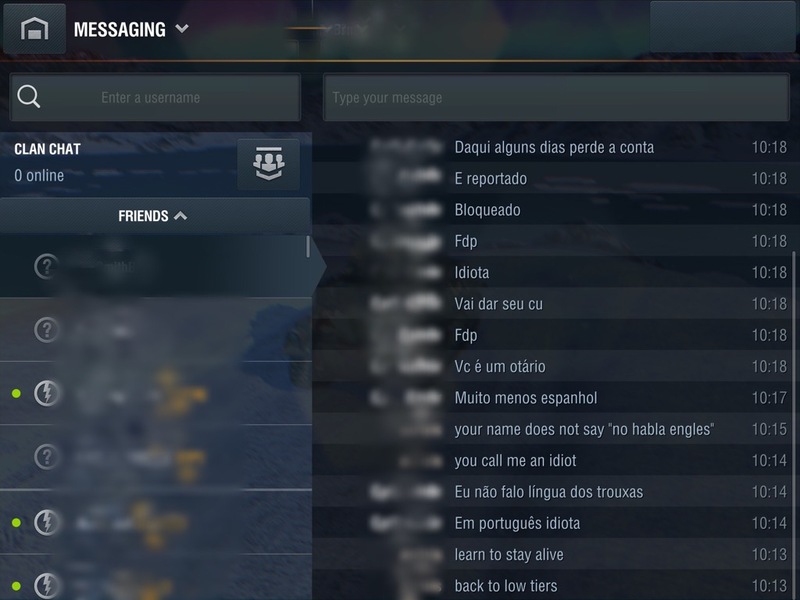 Was hoping to provide translations to WG, in case whoever reviews it has less language knowledge than I do. Edited by acrisis, 04 December 2016 - 05:02 PM. He deserves to get banned, that guy is really salty. Meh, he said all the same pretty things we have all heard before. Only in Portuguese. Only novel thing here is that he sent you to the gas chamber. Haven't seen that one before in Blitz. If I call left, they go right. If I call right, they go left. If I don't call anything, they die at the spawn. moar liek they fled nazi germany when russian bias came. That's right imma conspiracy theorist who believes in truth in fiction. I went to Google Translate and then realized what it was before I even typed it in. Sad. I saw someone using in game chat to call another player a "Jew". I was astounded and thought "where did that come from and why?" before getting back to the battle at hand. I hadn't seen that kind of shite in a long time. Please report this guy. He was extremely offensive. Racist. Anti-Semitic. Anyway, the game would look much better without him here. I hope Wargaming kicks him out. the line at 10:19 references gassing a certain people group. Definitely should be reported.